Golfer’s Terrace @Jurong Country Club (Singapore) | Get Your Grub On! Another diet bail today. After intending to go for a salad close by the office my colleagues talked me into joining them for lunch at the Jurong Country Club. At first I thought this sounded really fancy but when we reached it was actually a nicely setup and down to earth – though country club style – hawker with a beautiful view over their golf course. They had a big variety of Western and a bigger selection of Asian dishes on their menu and I decided to go for the ’Beef Udon’. It actually looked really nice with lots of noodles, meat and veggies. 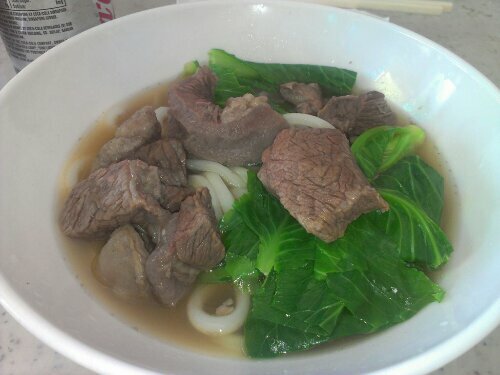 The broth was a bit blend and didn’t have this special udon soup kind of taste like ‘Tamoya’. The beef was nice and tender and was cooked for the right amount of time to easily fall apart without being dry. As always my meat complain would only be the many fatty bits but knowing bigger chunks of fat are very popular in Asia I leave this as a very personal note. Even that I doubt the noodles here are handmade they were springy, very tasty and heaps. What I liked the most about this soup was the South East Asian touch to it as the vegetables untypically were leafs of Kaylan. I never had them in an udon dish before but really appreciated the unfamiliar ‘al dente’ texture. I maybe wouldn’t make an extra effort to come from the city all the way here just to eat the udon but since it is so close to my work and my dish was tasty and under ten dollars I’m sure I will join my colleagues more often should they be heading this way again.